From the date of its release back in March, the Nintendo 3DS has had great expectations and for the most part, has struggled to live up to its hype. As the month of December drags on closer to the second wave of winter holidays, Nintendo can take solace in the fact that the 3DS is finally experienced a consistent boost in revenue, even setting Black Friday sales records and outpacing its predecessor, the Nintendo DS. A combination of major holiday gift interest, along with a slew of big name Nintendo 3DS games set for release in December are just some of the driving forces behind the resurgence of the console. The eight month sales for the 3DS have now overtaken the first year sales for the DS back in 2005. The 3DS had overtaken the 2.37 million sales mark for units by the end of November thanks to a strong effort in the last two weeks of the month, including Black Friday. One of the major game titles for the Nintendo 3DS, Super Mario 3D Land was released on November 13 to heavy sales. The title has quickly become the fastest selling Mario release of all time, already experiencing over 500,000 purchases. For whole console sales in November, Nintendo saw a 325 percent increase in sales increase for the 3DS over the numbers from October. This increase over October purchases are telling, especially when you consider that Nintendo had begun to steadily pick up 3DS sales this fall. Over 250,000 units of the handheld console were moved in October to make it the highest selling system of the month and second overall in sales for the year behind Xbox 360. In addition to the success of the 3DS, Nintendo experienced heavy sales for the Nintendo Wii during the Black Friday rush. Wii had its largest holiday numbers yet by selling over 500,000 units on Friday, November 25 alone. One interesting figure in a sales comparison between the 3DS and the DS is the fact that the DS enjoyed great success after a slow first year on the market to become the highest selling console of all time. 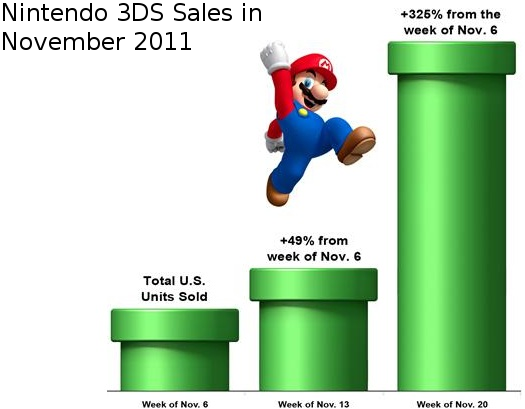 Nintendo is expecting similar results for the 3DS. With major game titles such as Mario Kart 7 and Sonic Generations likely to draw in big numbers, a big start for the second year of availability is a clear objective. Guest Author: This article was written by Justin Taylor.